One of the fun things about being married to an Italian is the recipes with the funny names. One of the fun things about having friends who are Italian is even more recipes with funny names – and links to websites with even more. 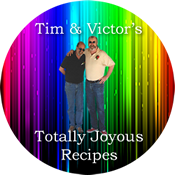 Our friend Judy turned us on to a site called Everybody Loves Italian and Victor has been having a blast reliving a lot of the recipes of his youth. Victor laughs and says he has the only Italian mother who didn’t cook. There’s a reason, though… She was number 10 of 11 kids and her older sisters did it all. The cookies and whatnot came from Aunt Tessie or Aunt Emma. You don’t reinvent the wheel in an Italian family. The one who knows how to make something the best is the one who makes it. And if that something happens to be a signature dish, you really don’t make it when they’re around for fear of possibly showing them up. A Big Mistake. 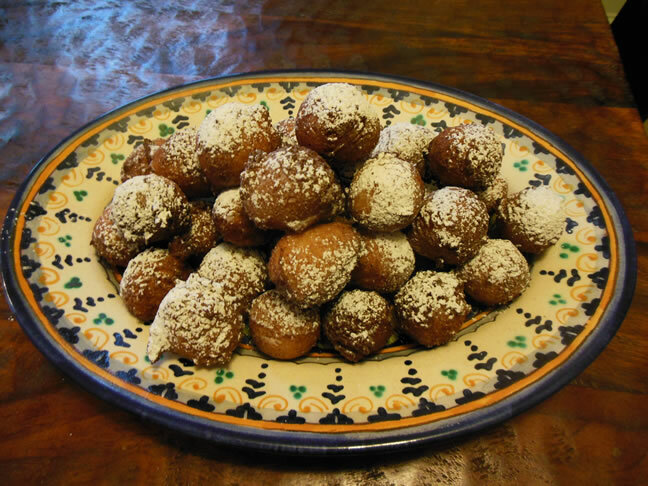 Whether Zeppoles were in the family repertoire is questionable, but Aunt Emma, especially, used to make several different sweet and savory fritter-type items, so these could be a variation on one of her themes. Or not. it doesn’t really matter, though, because he just made them and they are fantastic! They evoked a childhood memory and that’s what’s important. Well… that, and the fact that they’re freakin’ delicious. They’re also easy to make, so… No excuses. Head into the kitchen and make some, now! This recipe is adapted from Everybody Loves Italian. Heat oil 2″ deep to 375° in a pan wide enough to fry several zeppole without crowding. Mix two eggs into mixing bowl. Add all dry ingredients and follow with ricotta, vanilla, lemon juice and zest. Quickly mix until combined. Batter will be thick. Using a 1 tbsp scoop or spoon, carefully drop into the hot oil, being careful not to let them touch. Turn them for even browning and cook about 3 minutes or until cooked through. When still warm but cool enough to handle. sieve powdered sugar over them and consume! They really did come out great. Very light and airy, not very sweet, and with a nice lemon hint. We figure there are lots of things we can do with these, from cinnamon in the batter to different liqueurs. Methinks we shall have some fun with these!